Last night I decided to do a little something special for myself: make dinner. 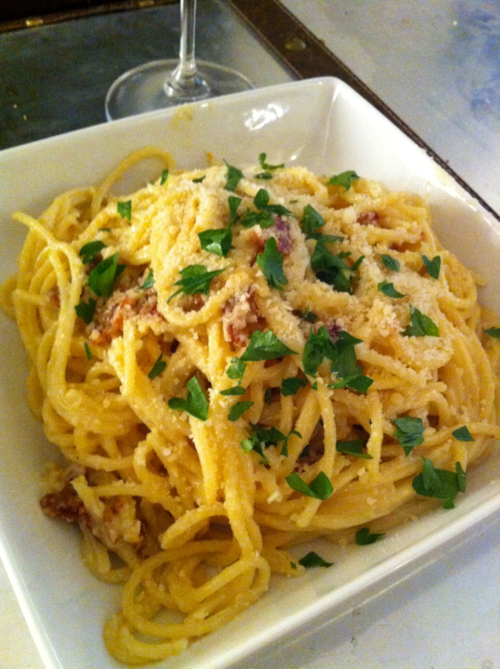 Using this recipe, I crafted this delicious Spaghetti Carbonara. While it’s not quite up to par with the ones I tried over and over again in Italy two years ago, it’s pretty darn delicious. If you have a recipe for this amazing pasta that you think might be better, please share! I’d love to try it out! Enjoy with a glass of Santa Margherita and a salad! tip – I’m not very good at the visual presentation of food, but it’s amazing what a little fresh chopped parsely can do to dress up a dish!